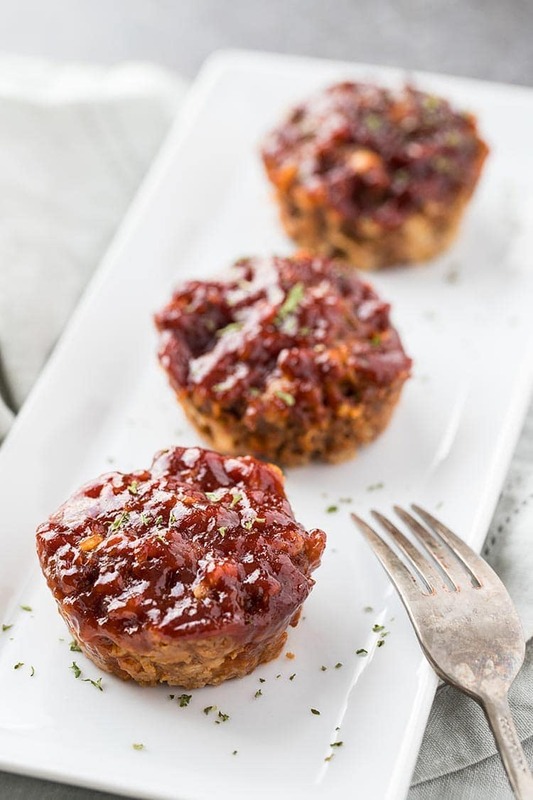 Full of great cheesy flavor, with a subtle but tangy glaze, these Mini Mozzarella Meatloaf Muffins are a breeze to make, and they freeze easily for future meals! We are a meatloaf-loving family! 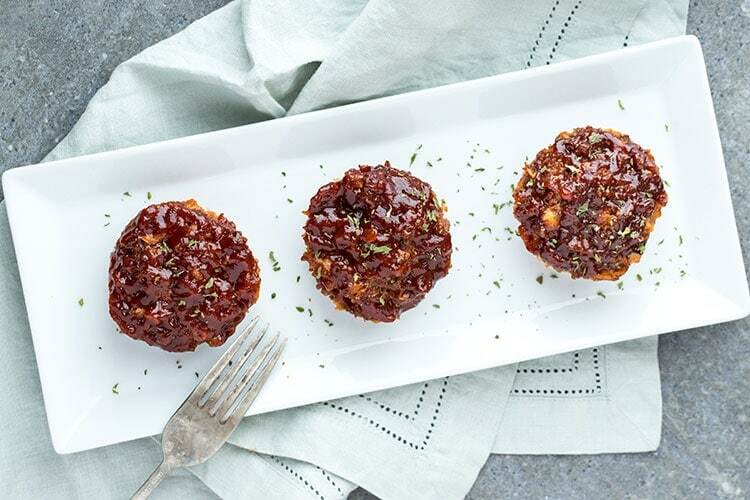 But sometimes the same-old same-old gets, well, old… Desperate times call for desperate measures, so when the grumbling about having meatloaf “…again…” rises above tolerable levels, I like to pull out these Mini Mozzarella Meatloaf Muffins as a change of pace. The addition of mozzarella and Parmesan cheese changes the flavor profile of these mini meatloaves just enough to make them an interesting twist on a classic flavor. And kids and adults alike will love the elegant individual portion size! 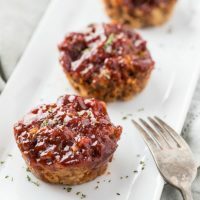 The ingredients for these mozzarella meatloaf muffins are pretty basic, and if you check your ingredients carefully, these can easily be made gluten-free (heads up on the oats and the Worchestershire sauce). 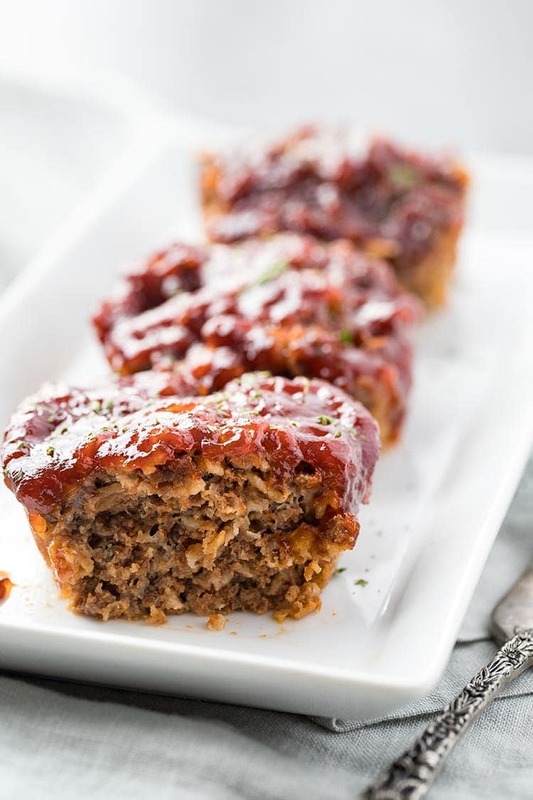 Now, as any good cook will tell you, the BEST way to mix meatloaf is with your hands, and these mini meatloaves are no exception. This is a great recipe to have kids help with as well. They can help measure and pour, and they love to dig in with their hands and help mix! But you don’t have to have lots of kids around to enjoy this recipe. Adults will enjoy the complimentary flavors and different textures in these mini meatloaves. They are a little bit cheesy, a little bit tangy, a little bit sweet, but 100% delicious! Not only do these mini meatloaves freeze beautifully, they also work well for weekly meal prep, too! These mini mozzarella meatloaf muffins freeze well both cooked or uncooked, so you have several options for how you choose to freeze them. 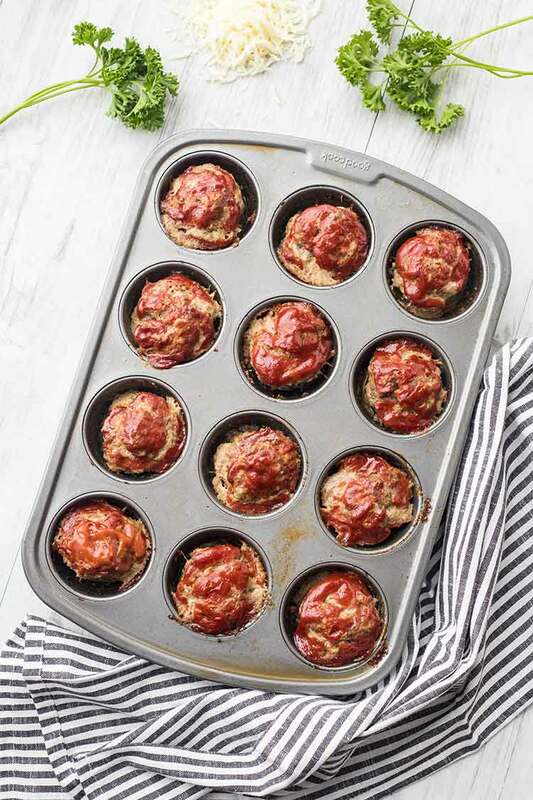 To freeze these meatloaf muffins before cooking, prepare them as directed, but then stick them into the freezer, right in the muffin tin, instead of baking. After a few hours, when the mini meatloaves are frozen solid, you can pop them out of the muffin tin and transfer them to a ziptop gallon-size freezer bag and place them back into the freezer. To cook, remove the mini meatloaves from the freezer and place them into a muffin tin, then thaw overnight in the refrigerator. Bake as directed as if you were cooking from freshly prepared. Or, if you’ve forgotten to take them out in enough time, which is the story of my life, you can cook them right from frozen. In this case, you’ll need to double the cook time. I personally prefer to freeze these mini meatloaves after cooking them – I feel like they hold up better in the freezer. I will generally undercook them by about 5 minutes, but you don’t have to. Make sure to allow the cooked mozzarella meatloaf muffins to cool, and then place them carefully in a ziptop bag in the freezer, being sure to lay them flat and with nothing on top of them. Once they are fully frozen you can move the bag around or stack other items on top of the muffins. To reheat, remove the muffins from the freezer and place them in the refrigerator overnight to thaw. Place the muffins into a muffin tin, top each with glaze, and bake for 20-25 minutes until heated through. I hope these Mini Mozzarella Meatloaf Muffins will be as popular at your house as they are at ours! Or make some up for your weekly meal prep – they save great in the fridge too! Place all ingredients for meatloaves into large bowl, and using your hands, mix until combined. Divide meat mixture into a 12-section muffin tin that has been sprayed liberally with non-stick cooking spray. (I use a #20 scoop for this.) Meat mixture sure fill the muffin cups to about the top. In small bowl, whisk together glaze ingredients until thoroughly combined. Spread glaze onto tops of each meatloaf muffin. Bake uncovered in a 350 degree Fahrenheit oven for 25-30 minutes. Remove from oven, allow to cool slightly, and serve! Prepare as directed through step 2. Place filled muffin tin into freezer for several hours or overnight. Once the mini meatloaves are frozen solid, remove them from the muffin tin and place them in a ziptop gallon freezer bag, then return them to the freezer for storing. 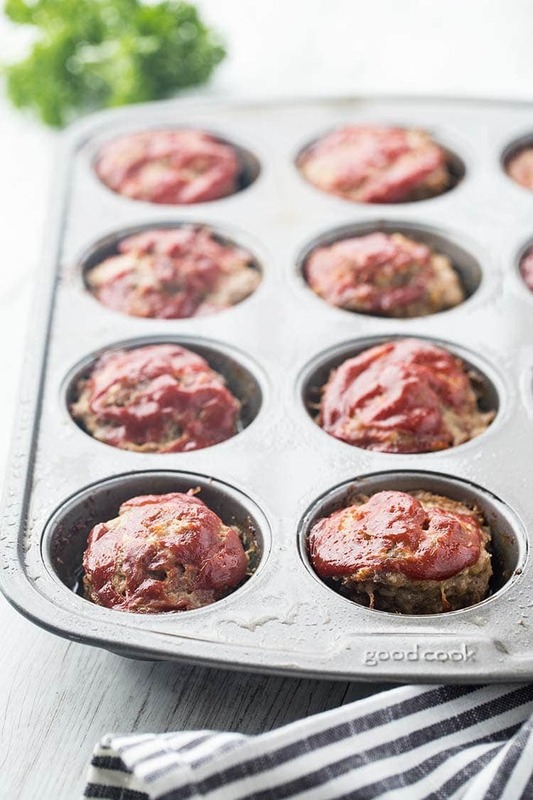 To cook, remove meatloaf muffins from freezer and place into a prepared muffin tin. Allow to thaw overnight in the refrigerator. Then continue with steps 3-6 above. Prepare as directed but skip steps 3 & 4. After meatloaf muffins have cooled, place them gently into a ziptop gallon freezer bag, and set them carefully in the freezer for several hours or overnight, but be sure to lay them flat and not put anything on top of them. (Once they are frozen solid, you can move the bag or place other items on top.) To cook, remove the meatloaf muffins from the freezer and allow to thaw overnight in the refrigerator. Place muffins into prepared muffin tin, prepare the glaze as directed, and spread glaze over tops of muffins. Heat in 350 degree oven for 20-25 minutes until heated throughout. Nutritional information is provided as an estimate only.